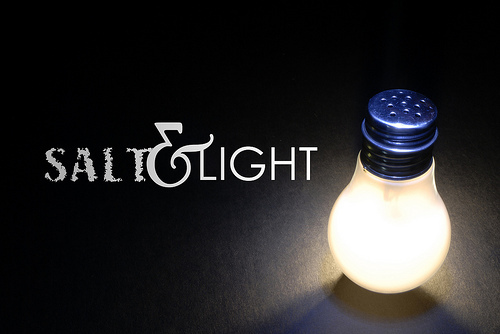 Salt and light are metaphors used by Jesus in the Sermon on the Mount, one of the main teachings of Jesus on morality and discipleship. These metaphors in Matthew 5:13-16 immediately follow the Beatitudes and relate to Jesus teaching his disciples. I’ve been thinking about what this means for me. When I unpack these verses there are four key themes that come out. I can clearly see my shortcomings. I’ve written these points mainly to challenge myself. Maybe there’s something in this for you too. Jesus emphasises to us that we have both the calling and the responsibility to be influencers in the world. 2. Salt which loses its saltiness is useless. Jesus’ teaching is challenging. There is little wriggle room for those who are Christians, but who have lost their saltiness, or their “edge”. Without the testimony of lives lived out with integrity and consistency with the principles that Christians claim to follow, the testimony of our lips is next to useless. Light shines on dark things and exposes what is there. This is a call to the church to challenge evil within our society, however uncomfortable this may be. The light that we bring, is not our own light – it is not who we are in ourselves, but rather the light of God shining through us. This doesn’t mean that we have to refer to God in every other sentence, but when the opportunity arises, we can share with another person the light that God has given us. Challenging? We hide our light when we stay silent in the face of discussion which is contrary to that which we believe. We hide our light when we fail to accept and conform with behaviours that are not in line with Jesus’ teaching. We hide our light when we don’t care for the needs of others, and walk by on by. Jesus challenges us all to be salt and light – to influence the world, and to be seen to be doing so. I’m still learning how to do this. What about you? Good stuff as always your way @ looking @ The Word always challenges me. Thank you, keep it up too good not too.